Well, Bob and I finally managed the technology, and we at long last synchronised our beer purchases, so that this evening we sat down and made our first trans-Atlantic beer tasting podcast. 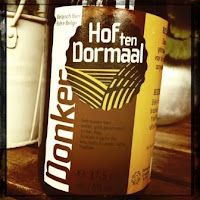 We tried Hof ten Dormaal Donker, an excellent farmhouse dark ale. Opening the bottles proved a bit messy, but the experience was well worth it, with rewardingly complex layers of flavours, including chocolate and brandy.